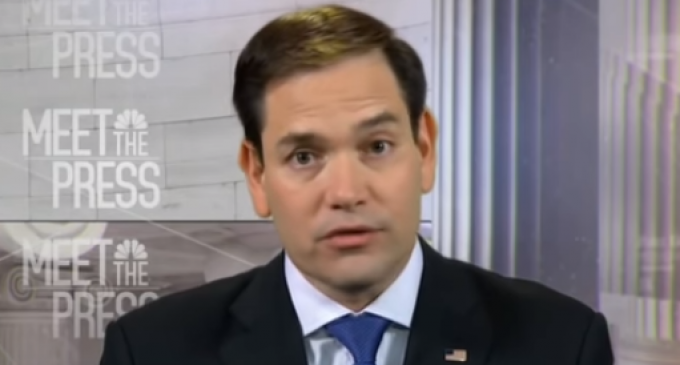 Sen. Marco Rubio (R-FL) told host Chuck Todd on Sunday’s “Meet the Press” that President Donald Trump that it would be a “terrible idea to declare a national emergency in order to get the border wall built and said he would fight it. “You have said you are opposed to the national emergency option. In three weeks, I know you have no appetite on either side of the aisle for another shutdown. So if that’s the only way to keep the government funded, he goes national emergency, how defiant are you on this option? Will you fight the president on this or not?” asked Todd. “I don’t think it’s a good I think it will be a terrible idea. I hope he doesn’t do it,” Rubio responded. “But would you fight him on it?” asked Todd. See the video on the next page. Who does to work for again?!? What a moron!! !